For other uses, see The Revenant (disambiguation) and Revenants in fiction. Revenants are part of the legend of various cultures, including Old Irish Celtic and Norse mythology, and stories of supposed revenant visitations were documented by English historians in the Middle Ages. The terms "vampire", "ghost", and "revenant" have been used interchangeably by folklorists, while some maintain that vampires derive from Eastern European folkore while revenants derive from Western European folklore, many assert that revenant is a generic term for the undead. Augustin Calmet conducted extensive research on the topic in his work titled Traité sur les apparitions des esprits et sur les vampires ou les revenans de Hongrie, de Moravie, &c. (1751) in which he relates the rumors of men at the time: Calmet compares the ideas of the Greek and Egyptian ancients and notes an old belief that magic could not only cause death but also evoke the souls of the deceased as well. Calmet ascribed revenants to sorcerers who sucked the blood of victims, and compares instances of revenants mentioned in the twelfth century in England and Denmark as similar to those of Hungary, but "in no history do we read anything so usual or so pronounced, as what is related to us of the vampires of Poland, Hungary, and Moravia." A possible precursor of the revenant legend appears in Norse mythology, called the draugr or aptrgangr, literally "again-walker", meaning one who walks after death. Stories involving the aptrgangr often involve confrontations with the creature. The aptrgangr resists intruders to its burial mound and is often immune to conventional weapons, which renders the destruction of its body a dangerous affair to be undertaken by individual heroes. In the folklore and ghost stories of Eastern Scandinavia, Finnish "dead-child beings" are described as revenants animated by restless spirits that could be laid to rest by performing baptism or other religious rites. References to revenant-like beings in Caribbean lore are often referred to as "The soucouyant" or "soucriant" in Dominica, Trinidadian and Guadeloupean folklore, also known as Ole-Higue or Loup-garou elsewhere in the Caribbean. William wrote that stories of supposed revenants were a "warning to posterity" and so common that, "were I to write down all the instances of this kind which I have ascertained to have befallen in our times, the undertaking would be beyond measure laborious and troublesome." According to William, "It would not be easy to believe that the corpses of the dead should sally (I know not by what agency) from their graves, and should wander about to the terror or destruction of the living, and again return to the tomb, which of its own accord spontaneously opened to receive them, did not frequent examples, occurring in our own times, suffice to establish this fact, to the truth of which there is abundant testimony." A Christian burial, indeed, he received, though unworthy of it; but it did not much benefit him: for issuing, by the handiwork of Satan, from his grave at night-time, and pursued by a pack of dogs with horrible barkings, he wandered through the courts and around the houses while all men made fast their doors, and did not dare to go abroad on any errand whatever from the beginning of the night until the sunrise, for fear of meeting and being beaten black and blue by this vagrant monster. In another story Newburgh tells of a woman whose husband recently died. The husband revives from the dead and comes to visit her at night in her bedchamber and he "...not only terrified her on awaking, but nearly crushed her by the insupportable weight of his body." This happens for three nights, and the revenant then repeats these nocturnal visits with other nearby family and neighbours and "...thus become a like serious nuisance," eventually extending his walks in the broad daylight around the village. Eventually the problem was solved by the bishop of Lincoln who wrote a letter of absolution, upon which the man's tomb was opened wherein it was seen his body was still there, the letter was placed on his chest, and the tomb re-interred and sealed. The villagers became sick and started dying, but eventually the bodies of the revenants were exhumed, their heads cut off, and their hearts removed, which ended the spread of the sickness. The chronicler Walter Map, a Welshman writing during the 12th century, tells of a "wicked man" in Hereford who revived from the dead and wandered the streets of his village at night calling out the names of those who would die of sickness within three days. The response by bishop Gilbert Foliot was "Dig up the body and cut off the head with a spade, sprinkle it with holy water and re-inter it". ^ Calmet, Augustin. Treatise on the Apparitions of Spirits and on Vampires or Revenants: of Hungary, Moravia, et al. The Complete Volumes I & II. 2016. p. 7. ISBN 978-1-5331-4568-0. ^ "Vampire". Merriam-Webster Online Dictionary. Archived from the original on 2006-06-14. Retrieved 2006-06-13. ^ "Trésor de la Langue Française informatisé" (in French). Archived from the original on 2012-05-26. Retrieved 2006-06-13. ^ Carl Lindahl; John McNamara; John Lindow (2000). Medieval Folklore: A Guide to Myths, Legends, Tales, Beliefs, and Customs. Oxford University Press. ISBN 978-0-19-514771-1. ^ England Under the Norman and Angevin Kings, see Chapter 11, Section 6 "Death and the Dead". 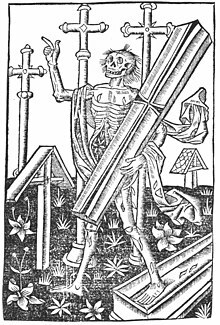 ^ Dealing With The Dead: Mortality and Community in Medieval and Early Modern Europe. BRILL. 5 February 2018. pp. 24–. ISBN 978-90-04-35833-1. ^ a b c June Michele Pulliam; Anthony J. Fonseca (26 September 2016). Ghosts in Popular Culture and Legend. ABC-CLIO. pp. 272–. ISBN 978-1-4408-3491-2. ^ a b Heide Crawford (30 August 2016). The Origins of the Literary Vampire. Rowman & Littlefield Publishers. pp. 14–. ISBN 978-1-4422-6675-9. ^ Clifton D. Bryant; Dennis L. Peck (15 July 2009). Encyclopedia of Death & Human Experience: 1-. SAGE. pp. 1002–. ISBN 978-1-4129-5178-4. ^ Calmet, Augustin (1751). Treatise on the Apparitions of Spirits and on Vampires or Revenants: of Hungary, Moravia, et al. The Complete Volumes I & II. Translated by Rev Henry Christmas & Brett Warren. 2015. pp. 303–304. ISBN 1-5331-4568-7. ^ Calmet, Augustin (1751). Treatise on the Apparitions of Spirits and on Vampires or Revenants: of Hungary, Moravia, et al. The Complete Volumes I & II. Translated by Rev Henry Christmas & Brett Warren. 2015. p. 305. ISBN 1-5331-4568-7. ^ Anne O'Connor (2005). The Blessed and the Damned: Sinful Women and Unbaptised Children in Irish Folklore. Peter Lang. pp. 99–. ISBN 978-3-03910-541-0. ^ David Keyworth (1 January 2007). Troublesome Corpses: Vampires & Revenants, from Antiquity to the Present. Desert Island Books. ISBN 978-1-905328-30-7. ^ a b Historia rerum Anglicarum, Book 5, Ch. 24. ^ Historia rerum Anglicarum, Book 5, Ch. 22. ^ England Under the Norman and Angevin Kings, pg. 613. ^ De nugis curialium, Book 2, Ch. 27. Calmet, Augustine (1751). Treatise on the Apparitions of Spirits and on Vampires or Revenants: of Hungary, Moravia, et al. The Complete Volumes I & II. Translated by Rev Henry Christmas & Brett R Warren. 2015. pp. 303–305. ISBN 1-5331-4568-7. Bartlett, Robert (2000). England Under the Norman and Angevin Kings 1075-1225. Oxford. ISBN 0-19-925101-0. Caciola, Nancy (1996). "Wraiths, Revenants and Ritual in Medieval Culture". Past & Present. 152: 3–45. doi:10.1093/past/152.1.3. JSTOR 651055. Walter Map, De nugis curialium. William of Newburgh, Historia rerum Anglicarum (History of English Affairs), full text online.